I thought it is going to be tough shopping with 3 kids... I was wrong! 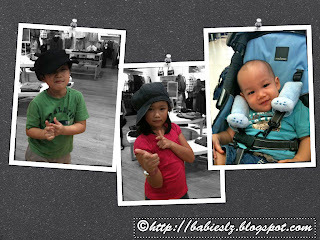 My 3 little ones were quite well behaved. The times when LZ 'fight' were for our hp to play with and who go into the changing room with LZdaddy or me. Beanie slept in the pram at times or just to be carried for a while. Choosing clothes for L & Z are not anything like last year. I used to pick a few for them to choose from and that's it... Now, they walk around the shop and decide what they want. Seems like my LZ need me lesser and lesser... *sob* Come to think of it, I should be happy... It means that I don't have to feel stress out having to decide so many things right and that they are more independent? 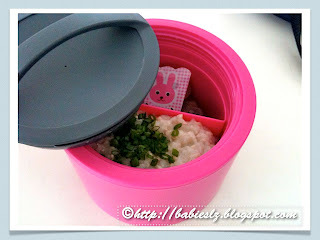 My girl wanted to have porridge for lunch today and I was so glad I found this cute container yesterday. She told the portion was just right and she was able to finish it before the extra lesson starts. 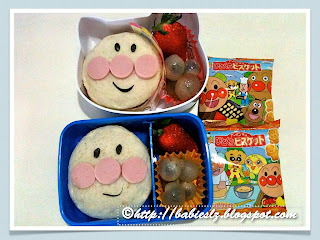 In the boxes: Anpanman man using Nutella sandwiches (L) & peanut butter sandwiches (Z), seaweed, sausages, longan & strawberries. These are Anpanman without eyebrow! Haha.... I totally forgot about the eyebrow till it was time for them to leave this morning! Thought of putting a ribbon for L's to make it more girly but I didn't have enough time... Coz mommy woke up late! 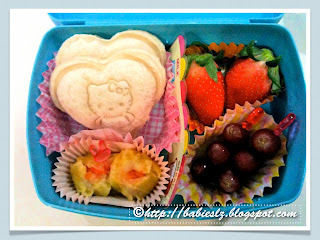 I was surprised that they asked for tuna sandwiches for today's bento. They seldom eat tuna, especially L. Sometimes when we have that and ask her if she wants it, she says "YUCKS!" Well, their taste bud change as they grow, I guessed... AND I am not complaining. 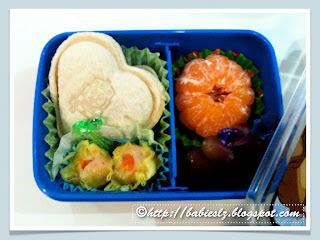 In the boxes: Heart shaped ( Hello Kitty for L & Thomas for Z) tuna sandwiches, siew mai, grapes, strawberries (L) & orange (Z). Another month and my Beanie will be 1 year old! I'm pretty sure he will be able to walk when he turns ONE! On Sunday, he took almost 2 steps to walk to LZdaddy and today, he walks 3 step towards me! 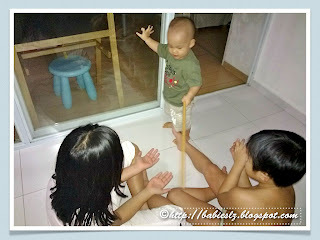 When he is standing, I let go and tell him "stay baby, stand properly ok." He happily stand there! The I moved back a little and tell him to walk towards me and he did that! This little boy of mine is so cheeky nowadays and knows how to show me a pathetic look whenever he wants something. ♥ He loves using his push walker. Spend more and more time walking around using the push walker. ♥ He can stand without support for abt 10 secs now. ♥ He often comes to me and says "mama mama...!" It happens when he either wants to sleep, wants me to carry or drink milk. ♥ He loves to dance! When he hears music, he will moves his body and head. So Cute! ♥ It is no doubt that he loves cars. Give him a ball and a car, he will go for the car. He pushes the car while he is crawling. ♥ He likes me to swing him up high! He giggles very loud whenever I do that with him. 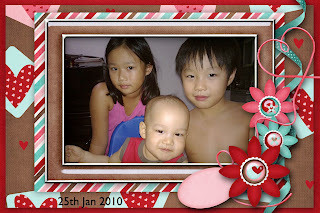 ♥ Next person he calls in the family is "jiejie". L was so happy! Z was disappointed that Beanie yet to call him. ♥ When I ask him to hug me, he will puts his head close to me. This is his way of 'hugging' me. ♥ Loves to hang out in the kitchen while I cook. He opens up all drawers and cabinets and take out the stuffs. ♥ When I ask him to pass the thing in his hand to me, he is able to do it. But not if it is food. Here is a pic of my LZ babies for January! Realised the only time I can take a good pic of Beanie is when he is on a highchair. L & Z will be ready with their smile while we wait for the right moment to shoot! Aiya! I should have recorded it instead of just picture! It is a simple game of scissors, paper, stone and you get a card when you play. Every shopping mall we go to, he will look out for the machine if there's an arcade. 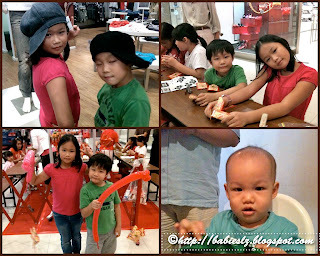 Today, he was so happy to see it again while we were shopping for our CNY stuffs. 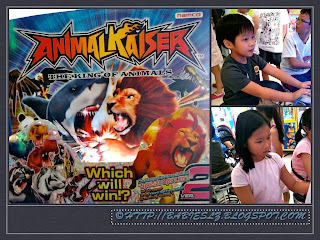 We reward them with a few rounds of games after shopping for hours! 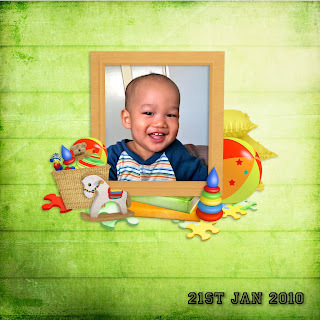 While Jiejie & Gorgor were having fun with the games, Beanie relaxed and enjoyed his snacks. 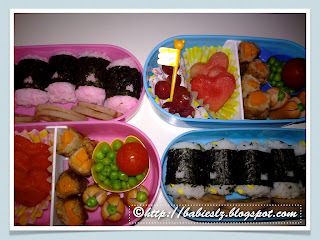 In the boxes: Rice, steamed lotus, grapes, heart shaped watermelon, peas, tomato, sausages, pork rolled with carrots. Instead of going home for less than an hout to have our meal, we (Z, Beanie & I) have our meal in the car while waiting for L. My 2 boys enjoy it! They get to watch TV when they eat which they can't do that when they are at home. Cheerful Beanie gave me a BIG smile this morning after morning feed. He smiles to me all the time but it is sooo tough to get him to smile for the camera. This is one of the rare moments that he smiles for the camera. 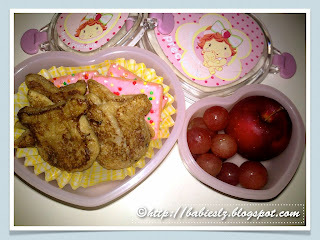 L asked for french toast for her bento quite some time ago and I almost forgot forgot about it. I know the french toast looked ugly but it is very tasty, that's what LZdadddy & LZ said (they had it for breakfast too). At least they can tell that there were bear and star shape french toast. I added a little sugar to the mixture before soaking the bread into it, so it taste sweet and to their liking. In the boxes: Grapes, strawberries, stir fried spinach noodles, flower shaped carrots, pikachu fishcakes, fishball(supposed to be a pokemon ball which doesn't look like one) and lotus root. 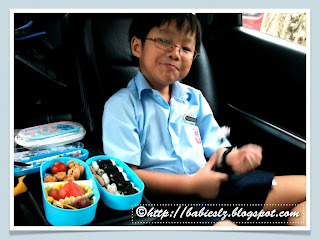 LZ told me they preferred to have early lunch during their 1st recess and I was glad to hear that. That means I do not have to send lunch to school today... 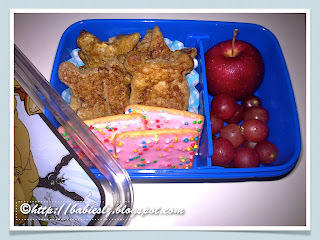 I noticed that they usually finished everything if I prepared lunch for 1st recess instead, coz by the time they have their 2nd recess, they may be a little too full to have a proper meal. 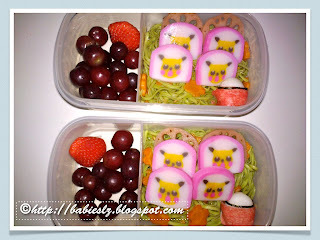 I wanted to give L other fishcakes coz pikachu is more for boys. But she was alright with it and find it cute. Yeah, I do have different pic/design fishcakes in my freezer, I never know when I need it. I finally received my travel voucher from Dumex today! Yippee! I only received it today coz the staff was very sweet to know that I don't intend to go holiday so soon and the voucher may expired before I decide to go. LZDADDY, FAMILY MEMBERS, NIECES, NEPHEWS, COUSINS, FRIENDS, DADDY'S FRIENDS, MY BLOGGING FRIENDS, NUFFNANG! (Why Nuffnang? 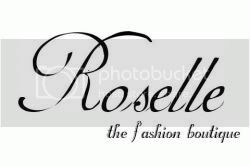 Coz without them nominating me, I will not be in the contest). AND READERS (some who have been silently reading my kids' blog), THANK YOU ALL FOR YOUR SUPPORTS AND VOTES! 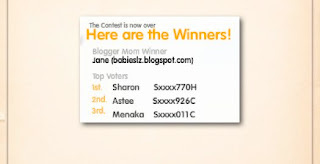 I would also like to congratulate my 'blogger twins', Astee for winning the Top Voters' prize! If you are interested in my interview with Dumex, you can read about it HERE. My girl showed me a letter from school last week, telling me she is chosen for the Health & Fitness Club! To be crude, it means that my girl is FAT & OVERWEIGHT isn't it!? Gosh! I can't believe it! Huh???? My girl overweight!?!? She is so active! She swims 1 to 2 times a week and ballet lesson twice a week! Besides that, she is very active, at home or outside. She eats healthily with lots of greens, fruits and less meat. At times I have to 'force' her to eat more meat. AND she doesn't eat unhealthy snacks often. When my girl found out what it was all about, she was shocked too! She went around the house shouting "I am fat! I am fat!" Then she started doing exercises! She said she doesn't want to be fat... I have to assure her that she is not fat at all. She is very vain and to let her join this club, I am quite sure what kind of impact it will have on her.... She may refuse to eat or does exercises vigorously or worse, become anorexic! While I was on PSG duties (last week), I went to the office and asked to speak to the teacher-in-charge. He was not available and I was told to fill up the form and to explain the reason/s to be excused from it. I finally get to speak to the teacher 2 days ago... He said that according to their record last year, L was considered slightly overweight, her weight just tipped over the scale. What surprises me was that she was not only chosen because of her weight, but also because she is not in any CCA! It is not compulsory to have any CCA in P1 & P2, hence we did not sign her up for any. Her enrichment classes, ballet and swimming already keep her busy throughout the week. Anyway, she has to go down today so that they can measure her weight & height again... I spoke to the teacher-in-charge again after the measurement. He remembered L and said he knows her as a very active girl. He explained that according to the chart given by HPB (Health Promotion Board), she just tip over the line and the chart is based on Asian size. He said even for him, he is considered overweight! The teacher is very fit and yet considered overweight! Unbelievable! I think HPB ought to review the chart. She is a growing child... How to stop her from eating? 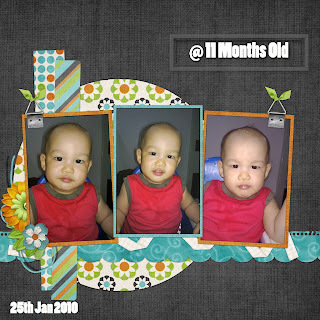 Haiz... What to do... She inherited her daddy's gene, heavy bones. She has to eat less white bread and white rice, which is her favourite... I also hope that by joining a CCA, they will take her off from the monitoring list. Oh! The next time they measure her weight, I will ask her not to eat first! You know, usually you get learning walker as a present when the child turns one. But we know for Beanie, we couldn't wait till he is one coz our little one already showing signs that he is ready to WALK! So here's video of Beanie with his walker and he loves it! Next, he check out the music and he can't resist dancing.